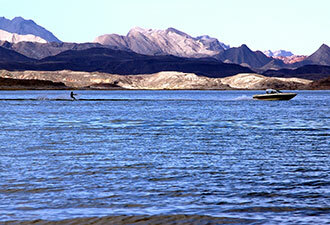 A study in contrasts -- waterskiing with a desert view. Mild water temperatures, friends (and a huge, inflatable banana raft), make for great fun in Boulder Basin. Boulder Beach picnic area is a great place for a lunch break before an afternoon of tubing, boating, hiking, or just lying on the beach. 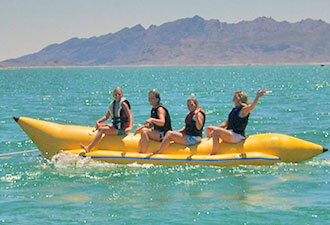 The best variety of outdoor fun in the desert Southwest is just a half-day's drive from Los Angeles, Phoenix, and Salt Lake City at Lake Mead National Recreation Area. What happens in Vegas may stay in Vegas, but if you need a break, the park is only 40 minutes away. In the summer, the park's 1.5 million acres come alive with boaters, swimmers, hikers, and bikers. 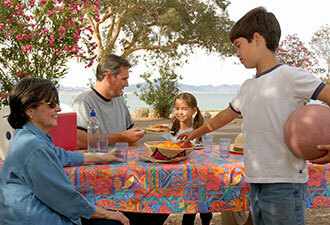 With two lakes, Lake Mead and Lake Mohave, finding a place to cool off is easy. The scenic mountains, canyons, and rock formations around the lakes are a relaxing setting for an outing with family and friends. Looking for a total escape from civilization? Come out to the lake and sleep under the stars in one of our beautiful campgrounds. If you are more inclined to kick back with most of the conveniences of home, pull your RV into a full-service space or give a houseboat vacation a try–where a lakefront view is always guaranteed! Head out on the lake in your boat and find a secluded cove. Camping is allowed along most of the lake shore. Lake marinas offer a wide selection of boat rentals to fit most vacation budgets from patio boats and personal watercraft to speedboats and houseboats. Take along a rod and see if the fish are biting. And there is more than fish in the waters of the Lake. On July 21, 1948 a U.S. Air Force B-29 Superfortress crashed into the lake. The 5-man crew survived, but the plane disappeared into the depths, lost until 2001. National Park Service archeologists have documented the wreck and are studying the preservative effects of the cold water at the bottom of Lake Mead. For a total veg out, find a shady spot, have a cool drink, and read up on all of the history of the area. Archeologists have found evidence of Native American cultures dating back up to 10,000 years when the place was a lot cooler and wetter. European explorers, including famed historian John Wesley Powell, started poking around in the 1800s, leading to settlements and a need for reliable source of water. Boulder Dam, now called Hoover Dam, went up across the Colorado River in 1931. The reservoir the dam created is Lake Mead, which became the nation's first national recreation area in 1964. Today, you can walk or bike along the historic route used to build the dam–but it's hot out there so remember to drink plenty of water and slather on that sunscreen. Got questions during your visit? Stop by the visitor center or one of our entrance stations where National Park Service rangers are waiting to welcome you and help you get the most out of your stay at Lake Mead National Recreation Area.